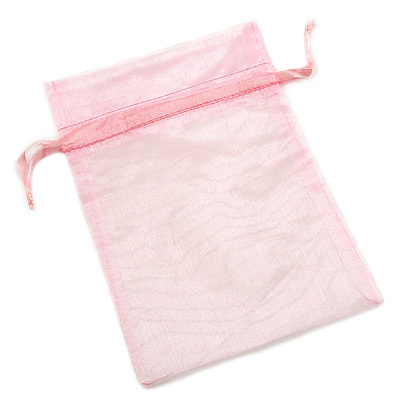 This Organza Drawstring Pouch is in Pink colour. It is woven with sheer lustrous nylon fibers. The pouch has a drawstring on the top and can be easily closed by pulling apart the strings on both sides at the same time. It can be opened by pulling apart its sides that are close to the drawstring. The synthetic material is crease resistant, so when the pouch is closed and then opened there will be little or no creases on it. The pouch has a very useful size of 20cm long by 15cm wide and can store anything from rings, brooches and pendants to larger bangles, armlets and necklaces. This Organza Drawstring Pouch is a simple, yet effective way to package and to store your jewellery items. It also can be used a gift wrapping. The pouch is available in 9 different colours on our website and is an essential accessory to any type of jewellery - don't forget to buy a few!